Thanks to the miracle of vaccines, we’re close to wiping out the polio virus. But that very success brings its own set of fresh challenges. We need some safe form of the virus in order to keep manufacturing vaccines, but those are in short supply the closer we come to eradicating polio entirely. Now a team of scientists, headed by Philip Minor from the National Institute for Biological Standards and Control in the UK, think they’ve demonstrated that a new strain of polio could be the safest choice. They described their solution in a paper published today in PLOS Pathogens. 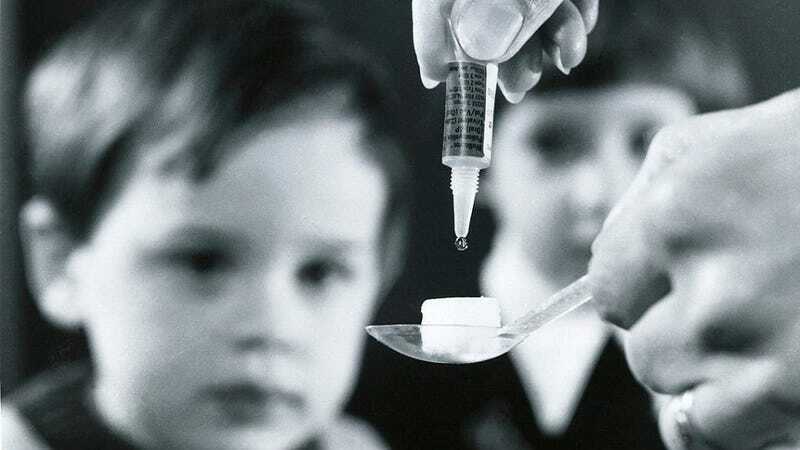 There are two forms of the polio virus currently in use for vaccines. The first is an attenuated vaccine, mutated so it exposes its hosts immune system to the virus in order for the host to develop an immunity. It doesn’t cause the person to come down with polio, but it can change and sometimes it becomes more virulent. The other vaccine is a dead virus that absolutely cannot spread the disease, but must be made from the living (dangerous) version of the virus. The UK researchers came up with their own strain of the virus, grown in cell cultures. When the viruses were injected into mice which had been given a human receptor for the polio virus, none developed paralysis. This indicated that the strain had not grown more virulent. The mice developed an immunity to more virulent strains after exposure. Similarly, macaques who were fed small quantities of the virus, and whose feces was then tested for the virus, did not get sick after ingesting it. The inability to infect primates by mouth and the lack of virulence were two main factors in the WHO’s choice of the Sabin strain. The researchers hope that their strain will replace it—or that the WHO will measure other contenders by the same qualifications and pick a safer option. Whichever strain ends up the victor, it’s pretty cool that a hundred years ago polio was a mysterious, much-feared scourge. Now we’re thinking about what weakling version of it to keep around as insurance after we wipe the virulent version off the face of the Earth.